Subscribe to E Line Updates and get project news delivered to your inbox. Metro Transit is planning improvements to the Route 6 corridor with the E Line Bus Rapid Transit project. The E Line will substantially replace parts of Route 6 in the Hennepin Avenue corridor, serving uptown Minneapolis. Bus Rapid Transit brings better amenities, faster service and a more comfortable ride. The E Line is one of several planned Bus Rapid Transit lines that will bring faster, more frequent service to the region’s busiest transit corridors. Learn more at metrotransit.org/abrt. Sign-up to receive project updates. For more details, refer to the Public Engagement page. Metro Transit's 2012 rapid bus study identified a Hennepin Bus Rapid Transit line that would run four miles from downtown Minneapolis to the future West Lake Street Station on the METRO Green Line extension. Since that time, community members have expressed interest in a longer E Line corridor to serve more places along Route 6. 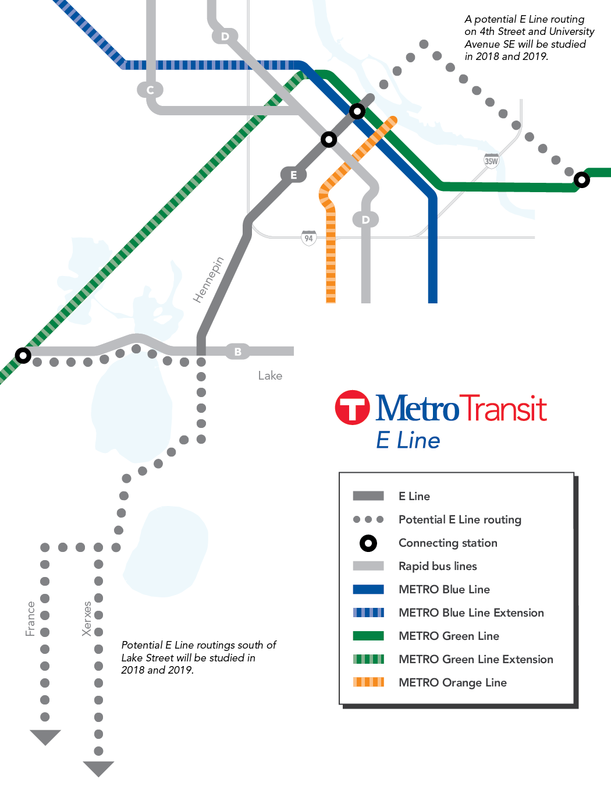 In 2018, Metro Transit will study the corridor again to determine whether other parts of the Route 6 corridor should become part of the E Line. Following the corridor study, E Line station planning will begin in 2019. Pending full project funding, E Line construction could begin as soon as 2023.